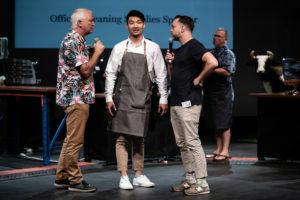 Ken Te placed third at the Meadow Fresh New Zealand Barista Championship (MFNZBC) 2019 and took the prize of Best Newcomer. NZSCG Chair Nico Refiti sat down with him to get his views on competing for the first time, his time in the industry and how he prepared for the competition. Nico: Firstly, congratulations on your placing at the Meadow Fresh New Zealand Barista Championship and winning Best Newcomer this year. For those who don’t know you, give us a bit of background on your barista history. Ken: I’ve not been in coffee for too long, maybe the past six years or so. I started at Starbucks actually where I was for around 18 months working first as a barista then moving on to manage the store. We only had a superautomatic espresso machine and while this got me in the door of the coffee industry I felt like I was missing out on the potential of coffee. This led me to find a part-time job as a barista at a small café in Milford two days a week while working the other five at Starbucks! 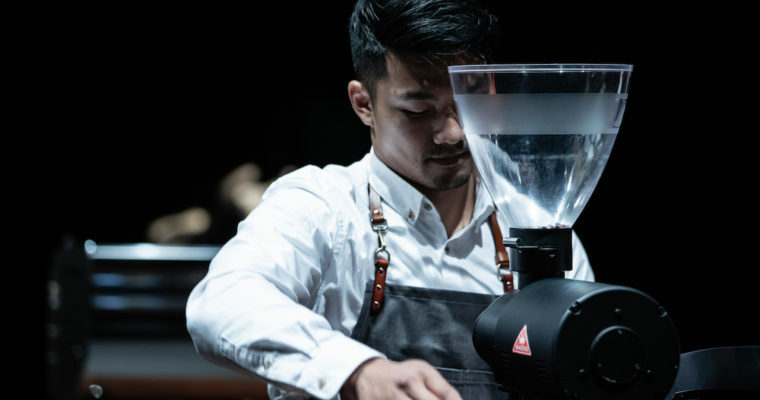 My first specialty coffee job was at RAD in Mt Eden where I was for two years and started getting more involved in the industry including helping Isaac Yu at NZBC in 2017. Over the last couple of years, I’ve helped with the openings of cafes first Daily Daily and then joined Society Coffee and A-Block about a year ago. These days I spend some time in the café both on the tools and helping manage the store as well as sales for Society Coffee. When did you start thinking of competing at NZBC? When I went to NZBC in 2017 I first thought I might like to compete. 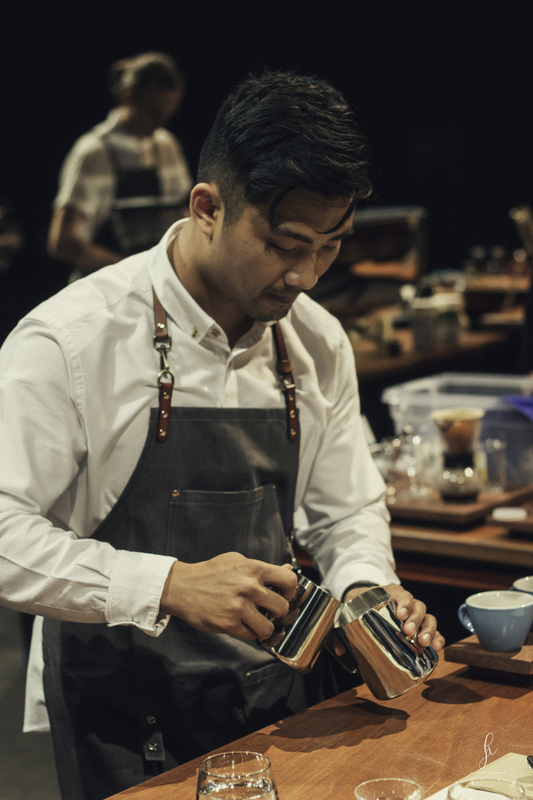 I was assisting Isaac Yu that year – mainly polishing glasses and running around getting things but really enjoyed hearing the passionate baristas and felt a sense of community. When NZBC 2018 rolled around I had the opportunity to compete but didn’t feel like I had the confidence or knowledge I needed to do it. We were just about to open A-Block and I was lacking the motivation to compete. This year it was David Huang who really encouraged me to compete. He said I didn’t need to take the gold but I needed to push myself to improve and learn. I committed to competing about four months before the competition. How long did you prepare for? What did that look like day to day for you? I spent three months preparing for the competition while still working full time. We started with sourcing coffee for the competition and tasted some samples from Three Brothers. I was really impressed with a Java varietal from Finca El Robel in Colombia and we ended up getting both a honey and natural process along with some cascara from the same farm. My coffee was roasted by David and Michael Linh at Society Coffee and we settled on a roast with 14.5-15% development. It took me about a month and a half to write my routine and I started doing run-throughs just after Christmas when we closed for the holidays. Each week I did 1-2 run-throughs and then in the last days leading up to the competition I did nine days of routines in a row. Sometimes it was hard practising late at night wondering why I was doing this, another time I had just done a routine with a guest judge which hadn’t gone very well. The judge pointed out my failings in the routine and I found this negative feedback very motivating as I was really disappointed in what I had presented to them. I think this gave me the last push to refine my routine and keep practising! What were some of the themes you wanted to showcase in your routine? My idea was to bring a reasonably priced coffee to the stage and showcase how a good coffee can be a great competition coffee. I wanted to showcase these ideas of affordability in specialty coffee to the judges and audience. What was your Signature Beverage this year? My idea was to bring the whole flavour of the coffee fruit back to the table. I used cascara from the same farm, cranberry and cacao nib. Cranberry was the dominant flavour on the cupping table for me and I wanted to enhance this in my drink. Cacao nib reflects the drying process and lactic fermentation and the cascara reinjects the sweetness lost during the drying process back into the coffee. This gave us the whole experience of Java. All the ingredients were put in a soda syphon and charged with nitrous oxide for a creamy mouthfeel and served in an ice cold glass. Looking back on the competition, what did you take from it? The whole experience of competing for preparing a routine with my team was amazing. It was a lot of pressure being at the front of that team and learning was the biggest takeaway for me this year. 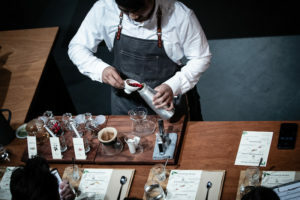 I loved seeing other competitors at the Championship and hear about their routines and work with people who are as passionate about coffee as I am. Coming third this year has woken me up to my potential in this competition. I never thought that I’d be in the top six and I was happy to be thankful just to make the finals! Does that mean we will see you back on stage again next year? Yeah… Should be. Should be. I know a lot more about Barista Championships and also understand myself more. I think I could give it a better shot and I’d love to go to Melbourne! David Huang my coach. Hugo Macdonald from member company Cofinet, Jessie Tan, Dani and Michael from Society Coffee all for helping me along the way. Thanks for chatting to us Ken and best of luck for next year!